I can’t recall ever seeing such a diametrically opposed political atmosphere. The Trump supporters are staunchly for him and his opponents are staunchly against. Now that Trump’s nominee to lead the Environmental Protection Agency (EPA), Scott Pruitt, was voted in by the Senate, what does this mean for the Bay? I find Pruitt’s opponents fearfully claiming positive advancements in Bay restoration will be lost, while supporters state that Pruitt will uphold the Bay Blueprint and cleanup efforts. What do we believe? Despite the Democrats’ boycott of the Senate Environment and Public Works (EPW) committee hearing on Thursday, Republicans were able to approve Pruitt’s nomination. Rules state that at least two members of the minority party must be present for a vote to be held, but all ten Democratic seats were empty for the second day in a row. Republicans voted to temporarily suspend the rules and subsequently voted to advance Pruitt’s nomination. Interestingly enough, these same tactics were employed by GOP committee members against Obama’s 2013 EPA nominee, Gina McCarthy, who was approved and has served in her post until being replaced by Pruitt. The political tug of war continues but what results can we expect on the home front of the Chesapeake Bay? Much of the opposition to Pruitt stems from his adversarial past with the EPA. While attorney general for Oklahoma, Pruitt sued the EPA 14 times, according to court records posted by the The New York Times. Environmentalists are therefore concerned that Pruitt will scale back the EPA and its enforcement of laws that keep our air and water clean. In matters that hit close to home, Pruitt joined a Pennsylvania Farm Bureau lawsuit last year that challenged the EPA’s authority to enforce cleanup limits set forth by the Blueprint. As we know, the Supreme Court declined to hear the Farm Bureau case last year, and the EPA maintained its power to enforce regulations set forth in the Blueprint. As to whether Pruitt specifically opposes environmental cleanup efforts or simply aims to make sure the EPA is operating within its Congressional limits, one can’t readily ascertain from the evidence. In another EPA lawsuit, Pruitt challenged the EPA’s negligence to consider cost-benefit analysis when setting forth the Mercury and Air Toxics Standards in 2011. 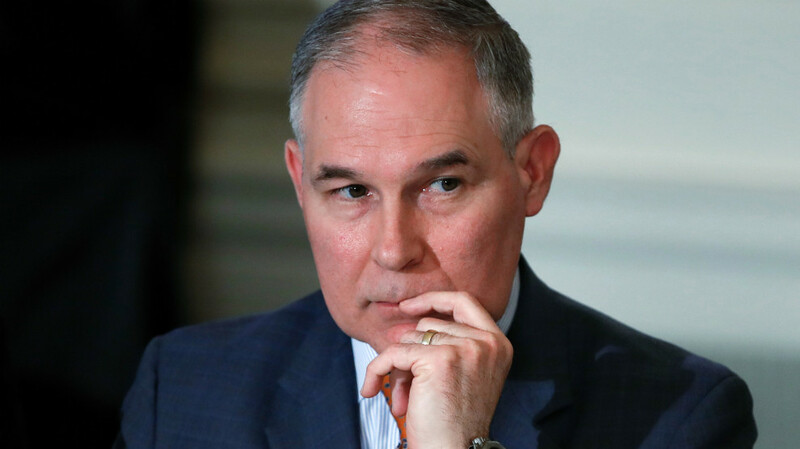 The suit argued that the “EPA acted contrary to law and arbitrarily and capriciously by not considering the costs of regulation in determining whether it was necessary and appropriate to regulate mercury from fossil fuel power plants,” Pruitt said in his written response to Democrats. Those Mercury regulations are still in effect despite the fact that the Supreme Court ruled in 2015 that the EPA made a mistake by failing to consider cost in its decision that it is “appropriate and necessary” to regulate power plant emissions (Michigan v. EPA,135 S. Ct. 2699, 2015 BL 207163, 80 ERC 1577 (2015)). Once again, it is inconclusive whether or not Pruitt supports unregulated power plant emissions or whether he simply wants the EPA to function in a sustainable manner (cost must always be considered for sustainability purposes). Based on his history, it is a possibility that Pruitt might enable the EPA to run more efficiently since he clearly opposes unrestrained costs and the unlawful overreach of the EPA’s power. On the other hand, if he only endeavors to keep costs low and to support companies who oppose environmental regulations, then the outlook is poor. I suppose only time will tell whether or not Pruitt will be an asset for Bay cleanup efforts or whether he will be a stumbling block. My hope is that the former will be the case.